The NNA and many trusty Northside resident volunteers work tirelessly to improve and beautify our neighborhood. Between the NNA and the 13th St NAC, we continue to initiate projects to keep this area safe and moving forward, keep a firm grasp on City politics and preserve our history. We work on our own and with the City and other agencies when possible to keep improvement funds coming to our neighborhood. We still need your help to make it happen! Below are just a few projects the NNA has been a part of. 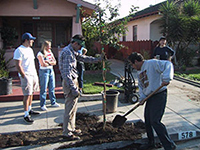 Once a vacant unkept lot owned by the City of San Jose located on 18th Street at Empire, the NNA obtained the city’s approval for the use of the site as a garden to be built and maintained by volunteers. The intent of the project was to demonstrate that draught-tolerant and California-friendly plant materials can be attractive and colorful, and to provide a flowering landscape that would attract birds and butterflies. To maintain the garden, we periodically organize work days, for weeding, planting and mulching, announcing the dates in the neighborhood email group and newsletter. The park strip was landscaped, along with many other park strips in the neighborhood, using funds from a Community Action Project grant. The Neighborhood Cleanup Project for Northside residents is sponsored by the City of San Jose and the Northside Neighborhood Association to allow San Jose residents a way to dispose of unwanted items for FREE. Pease visit the City of San Jose's website for more information on specific items that are accepted, and how you will be notified of the scheduled dates. We highly encourage all residents to take advantage of this great opportunity to continue keeping our neighborhoods clean of unwanted items. Often, you can find residents coordinating with neighbors to lend a hand with moving large items. We are grateful and appreciate all the support of volunteers throughout the years to make our neighborhood projects possible. Please contact us to inquire about how you can help volunteer and give back to our community. Who would know what's best for our neighborhood than our very own residents. The NNA is always welcome to ideas that aim to beautify and maintain our neighborhood, and fosters community engagement. Contact us to discuss a project that you would like to help implement and/or contribute to.